That, of course, caused the 2016 preseason to begin with lots of anticipation about Clemson-Alabama, Classic Game Part 2, for this year's College Football Playoff National Championship. And though we ended up heading down plenty of detours and side streets, here we are, with the CFP sequel we wanted in January and predicted in August: defending champ Alabama against near-dethroner Clemson. 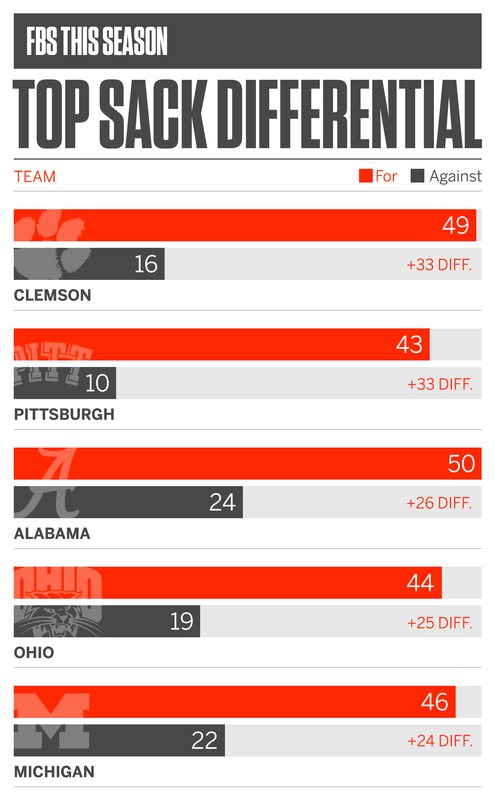 Here's a look at the numbers behind the rise of Alabama and Clemson to the college football mountaintop the past two years. When this year's College Football Playoff is over, there will have been nine total games since the playoff began in 2014. 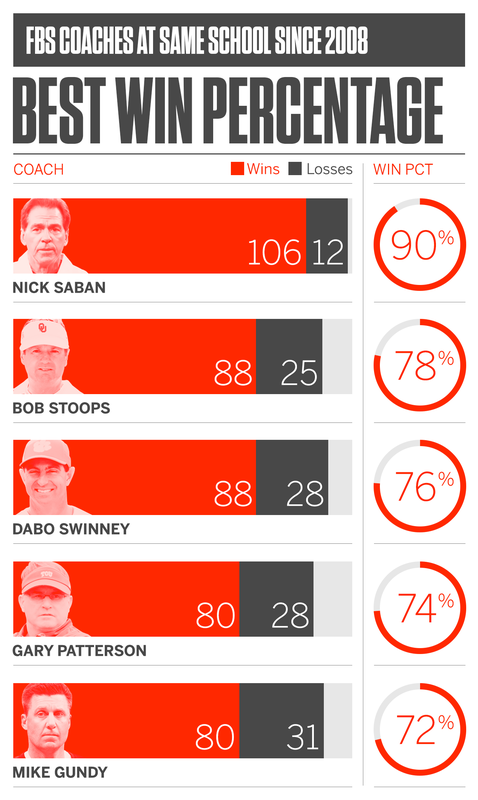 Of those nine games, Alabama, Clemson or both have played in seven of them -- 77.8 percent -- and each of the past six. Bama currently has the most playoff wins, with three; Clemson and Ohio State are tied for second, with two wins apiece. One key factor for both teams: pestering opposing quarterbacks. Can QBs Deshaun Watson and Jalen Hurts avoid the pass rush in the CFP title game? Both have been successful at avoiding sacks this season, but neither has faced the Alabama and Clemson defenses yet. The Crimson Tide have generated 50 sacks, while Clemson has 49. Contrast that with how many times their own quarterbacks have been taken down in the graphic below. Alabama's top-ranked defense took the field while trailing for only 61 plays all season. And on those 61 plays, the Tide, um, turned the tide quickly four times with turnovers, and two of those turnovers resulted in touchdowns. So who beat Alabama in the fewest plays while trailing? Clemson, of course, with just 27 snaps by the Tigers' defense when the scoreboard had them losing. Dabo Swinney took over as Clemson's interim coach on Oct. 18, 2008. Think Clemson is glad it eventually took that tag off Swinney? Since his first game, he ranks among the best in college football. Take three guesses at who the winningest coach in the nation is during that time. NFL teams certainly have taken notice of what both schools are stockpiling right now. According to Mel Kiper's most recent position rankings, the best draft-eligible wide receiver (Mike Williams, Clemson), tight end (O.J. Howard, Alabama), tackle (Cam Robinson, Alabama), inside linebacker (Reuben Foster, Alabama) and outside linebacker (Tim Williams, Alabama) are all playing in this game. Of the 120 players Kiper ranks at the 12 primary positions, a whopping 17 will suit up on Jan. 9.